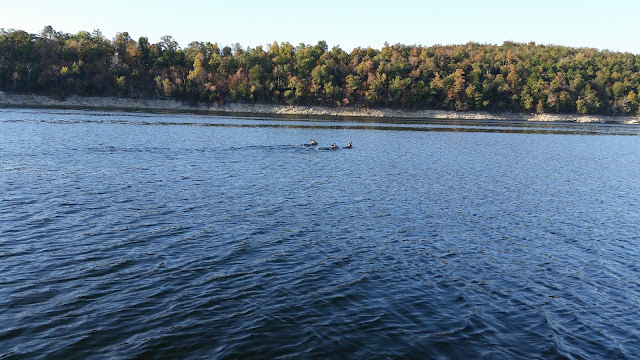 Norfork Lake's fishing pattern is entering into its fall phase. Striped bass are continually moving and not being very consistent in their feeding location. Over the last week I have covered most of the central to northern parts of Norfork Lake from the Robinson area, up to the state line and also back though the Fouts area and all areas in between. The most notable thing is that the bait has moved back into the creeks with very little bait being found in the main lake area. I have found scattered stripers back in the creeks feeding on small 2 inch shad. I have also noticed a few scattered fish along the deep bluff lines in the main lake. My guests and I have caught stripers back in the creeks during the early morning hours as well as the afternoon. Both live thread fin shad as well as vertical jigging with a spoon has been working once you find the fish. As the water temperature continues to fall the fish will become more aggressive in their feeding habits and will start to school. Any time now you will find stripers feeding after dark up close to the banks. If you decide to try the night bite get a few suspending jerk baits and cast as close to the shoreline as you can, then retrieve to the boat very slowly. I will start fishing after dark this week with the full moon. Largemouth, smallmouth and spotted bass are biting fairly well. The bigger bass started to move up into the sunken brush a week or so ago, but has since moved back out. I believe their move to deeper water occurred due to the drop in the lake level. Most of the sunken buck brush is now exposed or is out of the water. You can still find a few areas with brush out in the water, but I can only catch small fish in these areas. 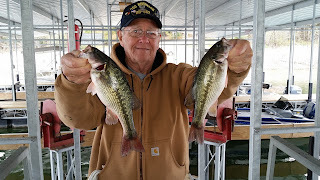 One of our guests loves to throw a jig and pig and is doing quite well. You will catch a lot of short fish, but the bigger ones are also in the area. You will be able to find some good bass in and around brush piles in 30 - 35 feet of water. Vertical jigging with a spoon will start to work as the water temperature continues to cool. In general, soft plastics are working the best worked along the bottom starting in 10 - 15 feet of water out to 40 feet of water. 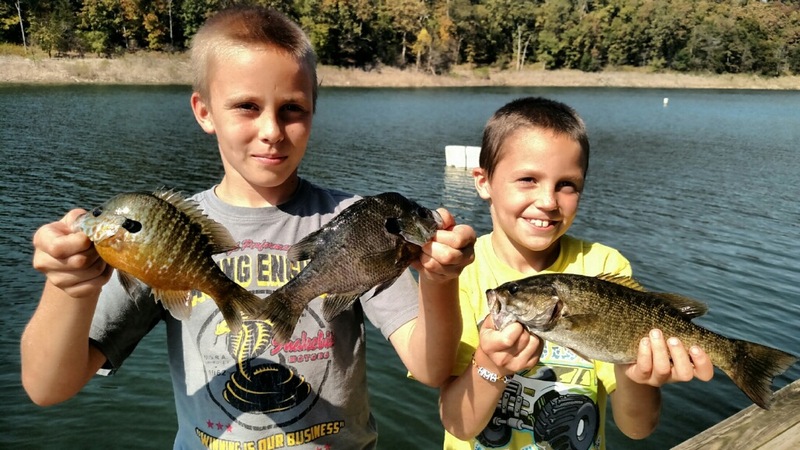 The bluegill bite is still very strong. If you want to fill up your freezer with a lot of tasty fillets get some crickets and fish around 20 - 30 feet brush piles. I am finding a lot of schooling white bass back in the creeks feeding on the the bait fish. 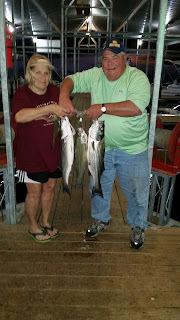 Most of the whites are small to medium sized fish, but are a blast to catch. Spooning has been working very well. 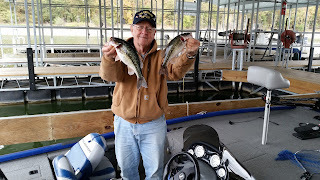 Crappie fishing has also been inconsistent. 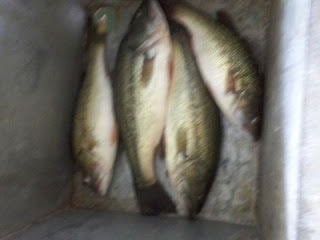 One of my lake friends caught 20 one day and then the next day they were gone. They are still roaming through the deeper water going from brush to brush. Keep checking out all your brush piles and you will find them. Norfork Lake water level continues to drop 3 - 4 inches per day. The lake level currently sits at 556.72 which is only about 3 feet above normal pool. Normal pool is expected to be reached by month end. The lake surface water temperature is also falling and this morning was 70.3 degrees. The water temperature will continue to fall with our cool night and normal day time temps. The main lake is clear with the creeks and coves stained. Over the last couple of days I have seen 10 deer crossing the lake. If this continues we are going to need someone to direct traffic!